Manitoba Screw Piles / Rev-Pile Inc. - Rev-Pile Inc.
What is a Screw Pile? Screw piles / helical piers are shaped like giant screws. With the use of a hydraulic drive system, they are turned into the earth until the screw portion (helix) reaches the desired load bearing soil. A screw pile consists of at least one helix shaped bearing plate attached to a steel shaft. The shaft is typically heavy wall pipe from 2-7/8" to 12" in diameter. Each helix is carefully formed with a set pitch. 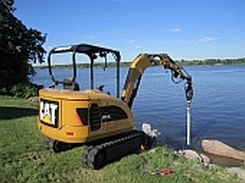 Installation is usually done with a hydraulic motor mounted to an excavator or skid-steer. 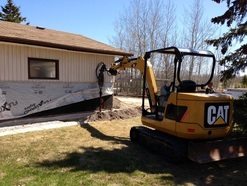 We also have portable equipment available for tight access areas such as crawl spaces, basements and back yards. Helical pier sections are fully extendable if necessary, allowing the helix plates to reach any specified bearing depth. Screw piles can be used to resist both compression and tension (uplift) loads. 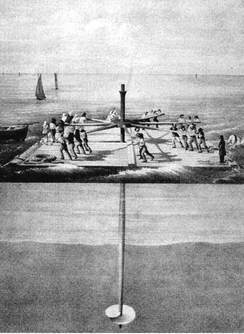 Screw piles / helical piers were first used as foundations for buildings and bridges built over weak or wet soil. They had limited use for much of the 19th and early 20th century as the installation was difficult without mechanical assistance. During the 1960's, hydraulic torque motors became readily available and the installation process became much easier. Screw piles were first used primarily for their resistance to tensile (pull out) forces. Utility companies frequently used screw piles as tie-down anchors for transmission towers and utility poles. Recent years have seen screw piles being used in many different applications. The screw pile's strong resistance to both uplift and bearing pressure allows them to be used in situations where resistance to combinations of these forces is required. Many advantages over traditional pilings, such as speed of installation and immediate loading capability have made screw piles the ideal foundation for mainstream construction projects. Many different types of equipment can be used to install screw piles allowing us to adapt equipment to suit your building site. Screw pile foundations can typically be installed using an excavator or skid-steer, eliminating the high mobilization costs associated with equipment used to install driven piles, drilled shafts and auger-cast piles. Remote sites benefit in being able to use more portable equipment and eliminating the need for expensive concrete. We can install in restricted access and difficult sites using a mini-excavator or handheld equipment. 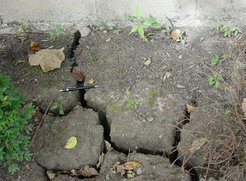 The Winnipeg, Manitoba region is well know for its expansive soils and the damage it can do to foundations. Screw piles are unique in that the bearing plate (helix) can be placed below the depth of seasonal moisture variation. The swell force on a shaft is directly proportional to the surface area in contact between the soil and the shaft. Since helical pier foundations have relatively small, smooth shafts compared to other foundations such as concrete, the uplift forces are much smaller and easily resisted by the helix anchored below. 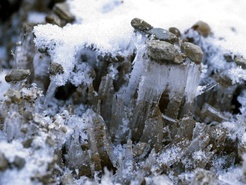 Manitoba is also well known for its cold winters and the damage frost can cause to foundations. 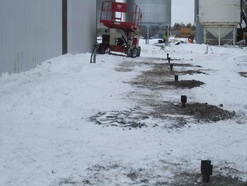 Similar to the way screw piles can avoid the problems of expansive soil, they are well suited to resisting frost heave. Since helical pier foundations have relatively small, smooth shafts compared to other foundations such as concrete, the uplift forces are much smaller and easily resisted by the helix anchored below. Helical piers are the perfect solution for areas with high ground water or loose soil. 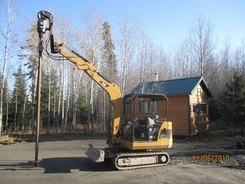 Screw piles can be installed in almost any type of terrain including muskeg, sand, swamp, lakes and rivers. Screw piles eliminate the need for casings and de-watering which can save both time and money. Screw piles can be installed in almost any weather because there is no need for concrete. This allows work to proceed without interruption or excessive cost, even in the dead of a Manitoba winter. 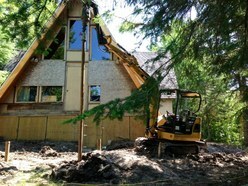 Screw piles are great for remedial applications such as underpinning. They can supplement or replace existing foundations distressed by differential settlement, cracking, heaving or general foundation failure. Screw piles can be installed in difficult to access areas such as back yards, between buildings, basements and crawl spaces. The work is low-impact with minimal damage to landscaping or disruption to building occupants. Helical piers can be removed and re-used by reversing the installation process. This makes the screw pile perfect for use on work camps, shelter buildings, portable offices, modular buildings, trailers and school portables. 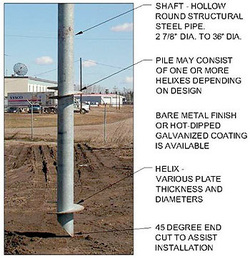 Screw piles / helical piers have been used on a wide variety of projects in Manitoba, Canada and around the world. Uses for screw piles include foundations for residential and commercial buildings, foundation repair, temporary structures, light standards, oil and gas industry structures, bank retention, retaining wall tie-backs and in the power utility industry. A screw pile can be used in almost any situation where driven or cast in place piles are currently used.